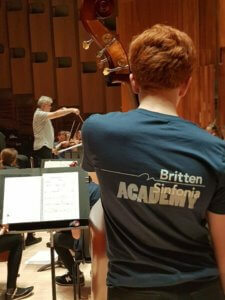 Creative Learning Director, Jen House reports on Britten Sinfonia Academy’s first course of the season. It is very early on a Saturday morning but the Silk Street entrance to the Barbican is already bustling as Britten Sinfonia Academy (BSA) members make their way to the Hall’s ‘Artist Entrance’. In the past month, no less than the likes of Daniel Harding, Terry Riley and Nicola Benedetti have stepped over this threshold and into the back-stage warren of private dressing rooms and stacked staging. Today, 37 young musicians follow in their footsteps to take to the famous stage for a rehearsal ahead of their first concert of the season. BSA centres on inspiration: inspirational repertoire, inspirational collaborations with internationally renowned artists in inspirational venues. This is the third rehearsal in BSA Year 5’s first course of the season. The largest BSA contingent to date, this talented group includes members from six counties across the East of England, at least half of whom are new to the BSA experience. 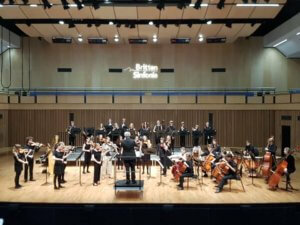 Having gained their places through a three-stage application and audition process, they are working towards their inaugural performance: under the baton of James MacMillan and the direction from the violin of Britten Sinfonia’s acclaimed leader, Thomas Gould, they will give their first concert at the launch of Britten Sinfonia’s residency at Saffron Hall. 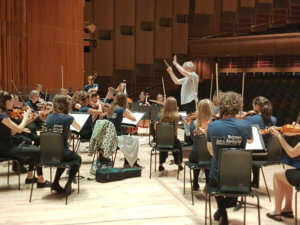 Rehearsing at the Barbican, one of the premier venues in the country, gives the fledgling ensemble the confidence and self-belief to realise a complex and challenging programme: MacMillan’s own One, written for Britten Sinfonia on the occasion of the orchestra’s twentieth anniversary four years ago, and Benjamin Britten’s elegant, soloistic and vivid Suite on English Folk Tunes. For new members, this first course will introduce them to some of the elements for which the parent orchestra is renowned: they’ll perform the Britten without a conductor, they’ll work closely to lead themselves in sections of the work for just winds and percussion or just strings, they’ll perform solos and of course, work closely with a composer in the rehearsal and performance of his piece. Saffron Hall is brimming with an excited, 400 strong audience when the performance day comes. Ticket holders for the mainstage concert, friends, family, press and industry professionals take their seats. In the wings, a heated discussion is underway: is minimalist music more difficult to play than, say, something really technical like John Adams? Even at the edge of the stage before they step out into the light, these young musicians are brimming over with passion for their art in all its diverse glory. BSA centres on inspiration and at the heart of that inspiration, the core of the ensemble’s identity are the members themselves. Across the season, they will showcase their skills as advocates, as a musical team, as artistic leaders and boundary breakers. We warmly invite you to come and take this journey with them. Come and be inspired!